Originally Submitted to FurAffinity.net on Aug 10th, 2009 03:52 AM. Before it was transferred to Inkbunny it had 226 views and 10 favorites. I finally had time to finish this one. I have been on this awhile too. I can not remember how many different drawings I did on this one and how many times I had artists block as well. This may be the most difficult piece I have done thus far with its complexity and the self requirement to research pictures of motorcycles and Freddie Mercury to get proper detailing and looks out of the picture. Also my patience was tried at times like waiting in line at financial aid at college at the beginning of a school year while the workers are working slower than maple syrup in the middle of a Minnesotan blizzard in January. LOL. ^\/^. 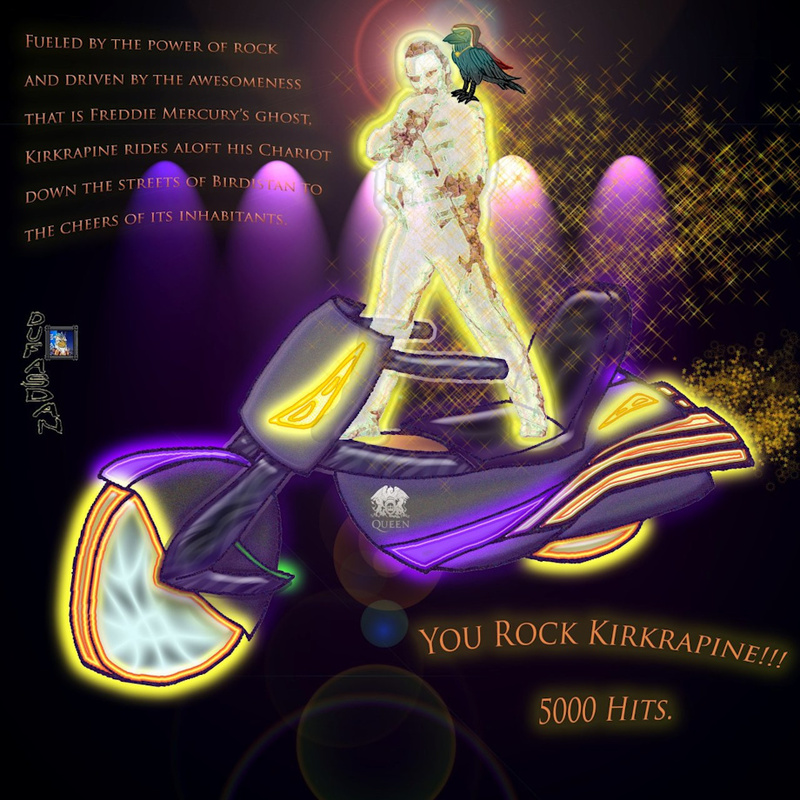 The motorcycle, Freddi Mercury and Kirkrapine were all hand drawn and then edited separately in various ways utilizing all three of my art programs. I finally had use for them all for once. LOL. ^\/^. The motorcycle was cleaned using the Microsoft Picture It Pro 9, inked in Corel Paint Shop Pro Photo X2 and then colored and edited in Adobe Photoshop Elements 6. Freddie Mercury was given a cleaning and sepia wash in Microsoft Picture It Pro 9 and then edited in multiple layers in Adobe Photoshop Elements 6 with each of the seven layers utilizing a different filter from the copies of the initial layer from Microsoft Picture It Pro 9. Kirkrapine was cleaned in Microsoft Picture It Pro 9, tinted and given texture in Corel Paint Shop Pro Photo X2 and then made into 24 separate layers in Adobe Photoshop Elements 6 with separate filters and hand painted touches to the feathers. At some point I was wondering if all this usage counted as multitasking since I had all three up at one time on both of my computers. LOL. ^\/^. The idea of Freddie Mercury as a ghost is Kirkrapine's in his description of what he wished in his commission. Plus it makes sense since he passed many years ago. The final decision to have Freddie Mercury standing while performing instead of manually driving is that I find that ghosts do not always need to do so anyway like how poltergeists operate. In addition I wished for him to look more impressive by being so awesome that he can perform and drive at the same time perfectly with no hands or feet what so ever solely using his mystical powers of rock while as a ghost. The initial picture of Freddie Mercury was the most difficult for me to draw since Kirkrapine specifically asked for a realistic face and body and, since I have great difficulty in drawing realistic humans and faces, I took a great deal of time on this one and even taught myself some new things just for this one. I finally became so flustered on him that I just printed a picture off of the internet and traced carefully on it just to get it right. LOL. ^\/^. The decision for the look of the motorcycle is due to the fact that it is simpler and many famous and notable rock stars simply do not drive what most people can get their hands on. John Lennon´s psychedelic Rolls Royce or Elvis' Pink Cadillac are an example of my argument. Also I found that a Harley was too difficult for me to draw and, since Freddie Mercury is from India, it did not fit the rock star in question. As such I drew a custom bike colored purple for royalty with yellow to gold custom neon all over. In addition, since the motorcycle is mystical in nature, I made the wheels out to be made of pure magic with electrical and water like patterns on it to seem like the wheels, like the bike, are solely powered by rock and roll which have been often associated with electricity and the water pattern gave it a look of mystical energy. The funny thing is that i initially had a neat windshield on the front but, no matter how I positioned Freddie Mercury, his leg kept going through and I had no intention to redraw him. LOL. ^\/^. Kirkrapine was the easiest to draw since avians are my specialty and required less to draw. Also this one was the most traditional and, as such, was quicker to draw and edit. The only thing new I tried are the lighting effects upon his eyes and the fact that I painted in details manually on his feathers which is something I never do on an art program due to the inaccuracy of my mouse and the fact that I have for years preferred to edit in such a way with my own hands and a colored pencil or marker. It turned out fine for once which I gracefully thank God for since the tendency for flaws on the computer for such detailing generally causes me to develop psychosis at some point. LOL. ^\/^. The idea for the bottom phrase is Kirkrapine's as a possible phrase in the art while the one above was mine for the reason that it helped to define what I was going for in the piece. The name for the piece sounded fitting for it describes nicely the reasoning why Kirkrapine is on the shoulder of the ghost of Freddie Mercury, plus it sound cool. LOL. ^\/^. This is a free commission as a prize to honor kirkrapine for capturing the 5000th page view on my Furaffinity art gallery. Congrats Kirkrapine. I hope it is to your liking. LOL. ^\^.